Traditional temperature logging methods are fragile and hard to implement. The RFID tag must send out a stream of raw time and temperature tracking data, which must be interpreted by a remote computer before any fitness for use decision can be made. This adds a lot of hardware and software complexity to the system, and communication delays or failure can degrade reliability. LifeTrack's patented stability monitoring, airplane "black box" style, temperature recorder and efficient transmission formats enable sophisticated time-temperature stability status and history data to be transmitted in the very limited number of user data bits allocated by the EPCglobal Gen-2 standard. The graph below shows some of the forensic logging data that can be output using only 128 bits (16-bytes) of EPC-Gen2 data storage memory. 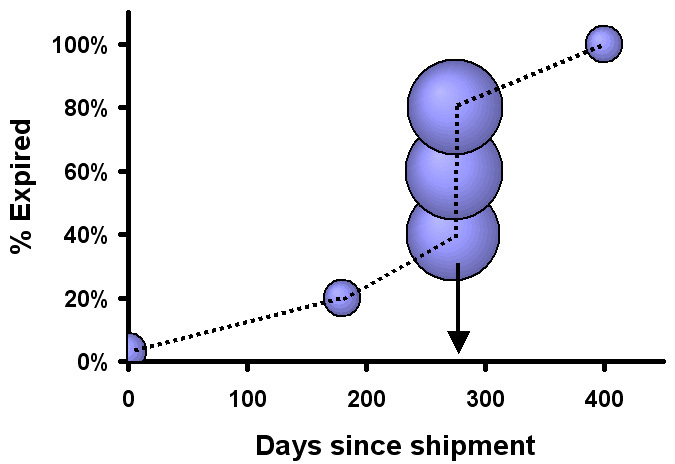 In this example, a refrigerated product with a nominal 2.5 year storage life was accidentally left at room temperature for two days on days 273-275 after shipment. This used up about 50% of the product's lifetime. After two days at room temperature, the unexpired product was then placed back into refrigerated storage for the remainder of the product's storage life. In the graph below, larger bubbles represent storage at higher temperature. 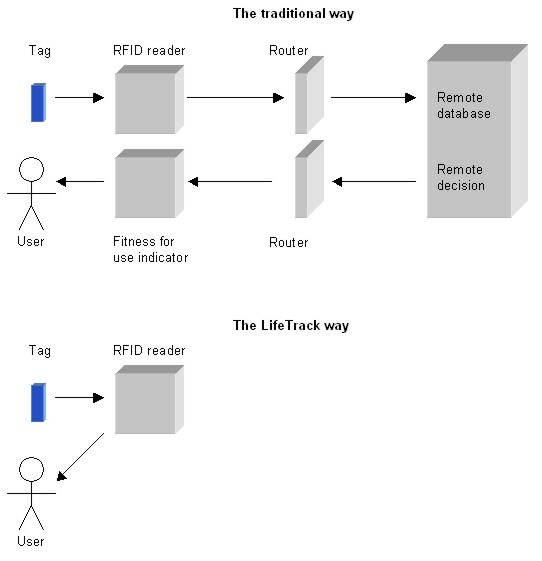 The LifeTrack RFID tag logger output shows this problem at a glance. The three large bubbles on days 273-275 (x-axis) and between 40% and 80% expiration (y-axis) show the results graphically. Numeric data output (not shown) allow the time, magnitude, and duration of the temperature excursion to be precisely determined. Yes, we can do bananas! Carolyn Walton, vice president of IT for Wal-Mart, in a recent March 2006 conference urged RFID and sensor technology to: "Think about bananas…I'll bet you didn't know what happens along that journey." LifeTrack can do bananas, as well as other environmentally sensitive materials with defined time-temperature degradation or ripening curves. With our very efficient EPCglobal Gen-2 data logging techniques, we can tell you exactly what happens along that journey. So yes, we can do bananas, we can do bananas today! LifeTrack stability monitoring technology can be implemented on single chip, flash programmed, ultra-low-power microprocessor - RF transceiver chips, such as the TI Chipcon family, presently available in about the $2.00 price range.